A vestibular nerve section consists of cutting the vestibular part of the cochleovestibular (8th)cranial nerve. This is a major surgery, generally done in an attempt to eliminate recurrent attacks of vertigo. The test results below are taken from a young woman who underwent total right vestibular nerve section (VNS), 7 years prior to the recording. They show what one should expect to find 7 years later after a total loss of vestibular function. In persons with more recent sections, e.g., 3 months post section, there is far more spontaneous nystagmus. Spontaneous nystagmus following VNS done 7 years prior to recording. There is only a slight spontaneous nystagmus. Spontaneous nystagmus should be nearly absent by 7 years post surgery. It never completely goes away when using video frenzel goggles, but it becomes unobservable without video frenzel goggles in less than a year. 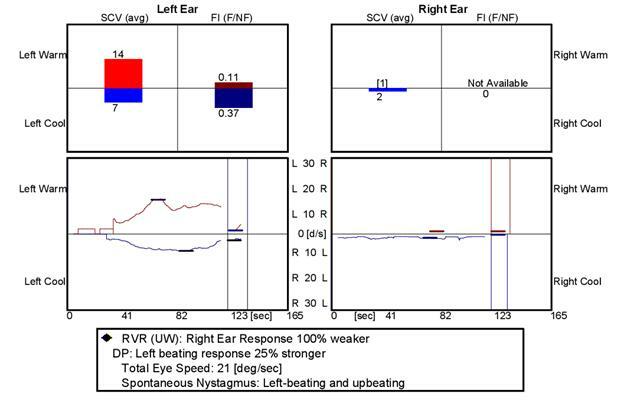 Vibration induced nystagmus generally persists forever after VNS. If it goes away, one should consider the possibility that the surgery or gentamicin treatment failed, or that there is a bilateral vestibular lesion. Most commonly the apparent finding of a bilateral vestibular lesion is due to medication. Caloric test post-VNS. There is no caloric response on the right side. The caloric test should be absent to ice water post VNS. It is sometimes impossible to eliminate vestibular function without also affecting hearing, and for this reason, incomplete VNS are sometimes seen. VEMP test post-VNS. There is no response on the right side. VEMP testing should be absent on the side of section. It is important to check both for the contralateral response as well as a posterior auriciular muscle (PAM) response, in persons with preserved VEMP's post section. This person had no response on the sectioned ear, showing that she has neither. The contralateral recording shows that she has no contralateral response, but the PAM recording was not done. Rotatory chair testing (not done in this patient) should show reduced low-frequency gain and increased phase. Rotatory chair testing is not sensitive to unilateral loss and it's main role is to exclude bilateral loss.